I’ll likely have a full article about Barkerville, British Columbia in a couple days or so since my time there was as strange as it was interesting. However, for now I’ll give you the photo of the week which I shot around one in the morning. I had set out to see if I could see the northern lights again. Unfortunately, the lights weren’t out that night. 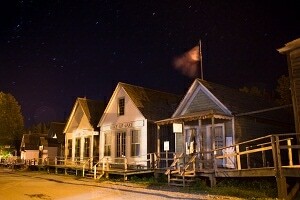 However, the sky was crisp, and Barkerville made for the perfect scene for shooting the star photography. The only problem was that I had completely lost my ability to think logically somewhere between way too much Chinese food and a couple glasses of Scotch. Regardless of my own self-sabatoge (more about that after the break), I managed to get the shot below and a couple others that I really do like. As I mentioned in the intro, there was a whole lot of stupid going on while I was out shooting the night I got the star photos in Barkerville. It all started while I was shooting my first couple of scenes. I couldn’t help but notice that my exposures were coming out a lot darker than my eyes were reading them. With star photography, you can do a little bit of testing to get a shot, but then it comes down to a little bit of educated guessing. I was getting frustrated so I decided I would try once more. As I failed again, I went to pack up my gear only to realize I still had my polarizing filter on (which would obviously reduce the light). I assumed pulling the filter off would fix my problems, but it didn’t. I was still needing to expose the shots way longer than I should have. After forcing a couple more shots out at higher ISOs than I would have liked to be using, I gave up and went to bed. The next morning, I went to pick up my gear to get some images. I went to twist my polarizer back on only to find that my 3-stop Neutral Densifying filter (like sunglasses for the lens) was on the lens the entire night. So not only did I have my polarizer on, but my ND stacked on top of it. That, my friends, is an epic fail. Also, that bring us to our lesson. The rule of thumb when shooting photography of any kind is to set up your camera at home before you leave to shoot. Take a shot of your desk, or whatever, just to make sure everything is good to go. That way you don’t find yourself trying to figure things out in the field. Oh, and also, stay away from the extra glass of Scotch before you go shooting the stars. There are never enough pictures of Barkerville. I have a few poor ones (I’m not a photographer) and a few memorites. I also have a novel that ends in Barkerville. Love the place and would like to spend more time there. I’ve never seen a night shot of if until now. Dave, later in the week – or next week – I’ll have a full article about Barkerville with plenty of pictures. Great photo and thanks for the tip. I’m planning to try out some long night exposures for the first time when I hit the prairies, and I’ll be sure to leave the polarizers, nds, and my flask in the trunk! Regardless of filters, though, I heard that it’s ok for long night exposures to be way on the dark side (specially when basing yourself off of a histogram). Was it like that for you? Vitor – When you’re doing star photography don’t even look at the histogram. Chances are your images are going to be mostly black, so your histogram will read low. I found that the worst thing to do is to underexpose really badly. If you do so you’ll end up with lots of noise. Depending on what is in forground and the effect I want, usually I expose star photos a couple stops below the brightest point of the image… if that makes sense. But like I said, toss out the histogram… star photography comes down to the eye test.